Lucy’s Original offers up surprisingly cheesy burgers, in the best way. Nearly a year after St. Johns’ beloved Little Red Bike cafe closed, the memory of that kitchen’s fried egg sandwiches and sinfully moist banana cake still brings on intense cravings. But mourn not forlorn taste buds: Little Red Bike co-founder Evan Dohrmann is dishing out some of the cafe’s triumphs from a mobile truck dubbed Lucy’s Original, often parked at 3925 N Mississippi Ave. Loyalists will be happy to find two of the cafe’s signature fried egg sandwiches during the week and old brunch favorites on Sundays. But the heart of the truck is new: a Minneapolis cult burger featuring an inside-out approach, with American cheese oozing out the center of the patty, plus pickles, thousand island dressing, and a potato bun. The name Lucy’s Original is a playful wink at the "who did it first" arguments rooted in many American classics (in Minneapolis, two pubs on the same street still compete for bragging rights over the burger’s recipe). Dohrmann uses the formula as a base, but adds enough spin to call this burger his own. 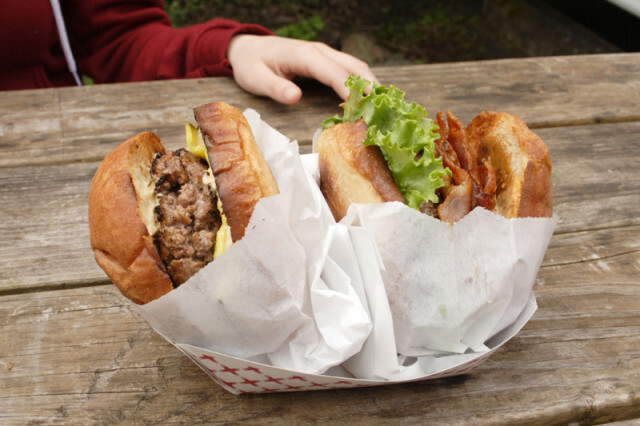 The best burgers hit a good ratio of lean to fatty, combining different cuts to achieve a taste that is truly beefy. 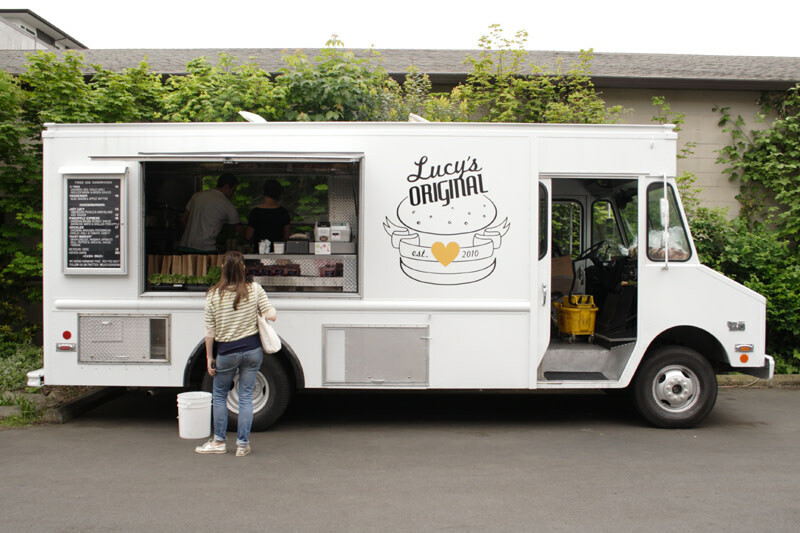 Lucy’s Original blends 25 percent brisket, 25 percent chuck, and 50 percent sirloin, all freshly ground each morning in the truck’s one horsepower grinder, a key to success. "You can taste the texture of freshness," Dohrmann says. Once ground, the patties are then shaped with the cheese tucked inside. The ratio was inspired by the wildly popular version at New York’s Shake Shack, owned by superstar chef Danny Meyers since 2004. A changing list of carefully considered toppings distinguishes Lucy’s approach: tomato confit and avocado; red chili aioli and a fried egg; or the ultimate standout here, grilled pineapple, sriracha mayo, and peanut sauce. These concoctions push the burgers into new territory—an unexpected flavor experience. Straying from the house formulas is discouraged, but an intriguing customer combo is usually humored. A great burger has a bun with just enough flavor and sturdiness to prevent the whole thing from turning into a soggy mess. Lucy’s made the right choice: a potato bun from local Fleur De Lis Bakery. The golden brown domes, delivered daily, are beautifully toasted on the flat top. 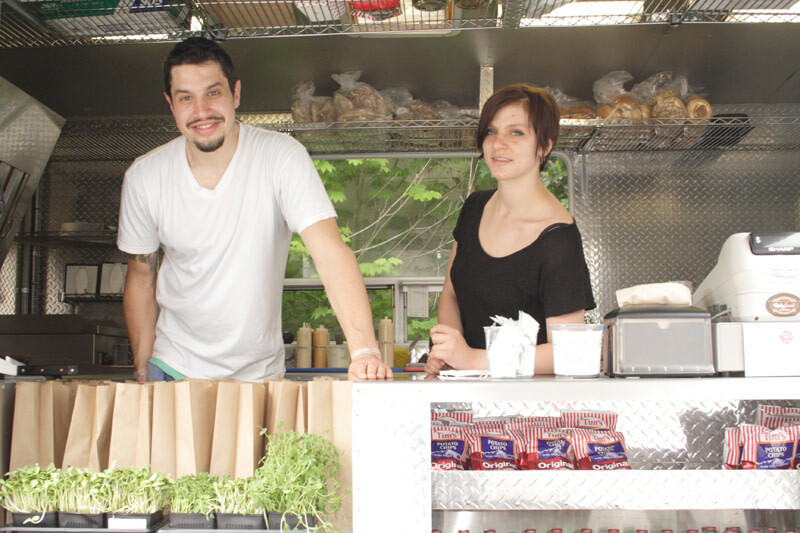 Dohrmann also commissioned a special seeded multigrain bun for his vegan Yacht burger, oozing vegan cheese and crowned with veggie specialties. Evan Dohrmann and Dani Nunez take a photo break from the morning grind. 2. The menu appears limited, but regulars know to inquire about the “secret menu” for a taste of something special. 3. Hours (sort of): Most days Lucy’s is open from 9 a.m. to 2:30 p.m., but opens at 10 a.m. on Sunday. One thing you can count on: they’re closed every Wednesday. Prices run $5–8. 4. Where Lucy is parking on First Thursday, 4–8 p.m.: Head to the just-opened CorksCru Wine Merchants, an inventive wine shop and occasional eatery at 339 NW Broadway. Eat outside or head inside for tables and wine flight tastings. Is there anything better with inside/out burgers and biscuits?